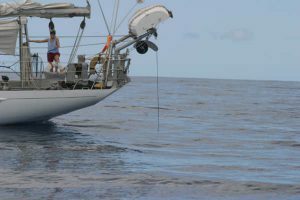 Cetos has teamed with Pelagikos (a non-profit research group) which operates the R/V Dariabar, an 84 Ft. motor-sailing vessel specially outfitted to conduct passive acoustic surveys of cetaceans. On this project we study natural history, ecology, vocalizations and behavior of pelagic cetaceans (particularly deep diving-species). Very little is known about these species, resulting in difficulties in developing science-based policies and management practices. The R/V Dariabar vessel has been used for a variety of research projects including marine mammal and bird surveys for the Moss Landing Marine Laboratories, ONR’s Bio-Acoustical Oceanography Workshops, and studies investigating the effects of noise on marine mammals with Cornell Universities’ Bioacoustics Research Program. Cetos first collaborated with Pelagikos during our 2005 research season while working off the islands of Kauai and Ni’ihau, and in the waters offshore of the Na Pali Coast. Onboard the Dariabar, Cetos researchers, visiting scientists, and collaborators (including some from Southwest Fisheries Science Center) conducted visual and acoustic surveys of marine mammals. Acoustic monitoring and recording of cetacean vocalizations was done using a dual hydrophone array system, and a sonobuoy system was set-up and tested for eventual use in future studies. These passive acoustic systems allow us to detect and track cetaceans (whales and dolphins) from the sounds they make. You can read more about the specifics of this study. See “Study Goals” and “Study Findings“.